Fallon Mitchell wants to turn her joy of baking and recipes that started with her grandmother into a business. Wounded Warrior Project® (WWP) helped the Army veteran move closer to making that dream a reality. 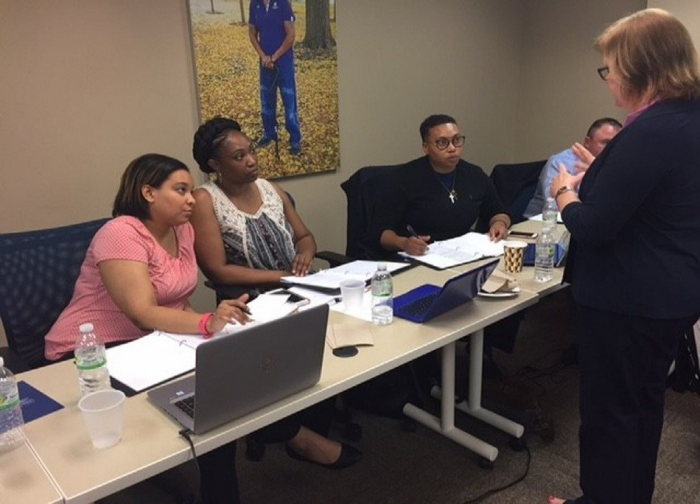 Fallon recently joined other warriors in an entrepreneurship workshop to understand the demands of time, costs, and promotion, and the likelihood of turning a profit. "We got a guidebook to start our own businesses," Fallon said. "One thing that stood out is the specific material tailored to my own personal business. One of the counselors used to own a catering business, so she really helped me move ahead." Veterans are highly coachable team players with specialized skill sets who are an asset to any team in the civilian workforce. All WWPcareer counseling services are offered completely free of charge to wounded veterans and employers. Veterans explained their business projections. They learned how to plan for sales, pricing, and revenue, as well as fixed and variable costs. The information was vital to Fallon as she moved closer to opening her bakery, A Piece of Joy. "I find joy in baking and writing poetry," she said. "A Piece of Joy celebrates that and the joy of baking by my grandmother, Mattie Pearl Williams. The workshop provided a specific plan of action for me to move forward, especially in relation to marketing and competition." A WWP staff member closely interacted with attendees during the workshop, advising them of additional services to support their recoveries. WWP programs and services assist injured veterans with mental health, physical health and wellness, career and benefits counseling, connecting warriors with one another and their communities, and long-term care for the most seriously wounded. "It was very beneficial to have other veterans and family members in the audience as it brought a level of comfort," Fallon said. "We shared camaraderie and built new relationships that will last long after the class ends." To learn and see more about how WWP's programs and services connect, serve, and empower wounded warriors, visithttp://newsroom.woundedwarriorproject.org/, and click on multimedia. Wounded Warrior Project® (WWP) connects, serves, and empowers wounded warriors. Read more athttp://newsroom.woundedwarriorproject.org/about-us.